How can we develop transformational leadership? What are the skills our team needs to learn? I’ve been asked this question a lot recently. The 21st century is both challenging and uncertain — business leaders know they need to upgrade their teams’ abilities. But where to focus? Functional expertise is shifting rapidly — constant learning is necessary to stay on top of the game. However, to thrive in change requires to move beyond subject-matter. We need to develop meta-skills — a master skill that magnifies and activates other skills. A meta-skill is a high order skill that allows you to engage with functional expertise more effectively. It’s a catalyst for learning and building new skills faster. Learning a second language or how to code constitutes a skill. A meta-skill, on the other hand, is your ability to learn new languages. Once you’ve developed that meta-skill, it becomes easier to learn a third or a fourth tongue. Below is my perspective on what it takes to succeed in the new reality. But before that, let’s address what are we solving for. The world is changing and how many organizations operate seems obsolete. It’s easy to see what’s broken, but predicting what the future model would look like is not that easy. Take higher education, for example. Most people believe the system is not working. Research shows that only half of graduates feel prepared for a job in their field, and 61% of managers feel graduate students are not ready for the workforce. However, the debate about if college should be improved, disrupted or eliminated is still going on. We live in a transition era — we don’t know what the new model would be (in education and many other aspects). Living in a transition era requires the humility to accept we cannot predict the future. That’s a giant step. Mainly, because we were educated to operate in predictable and controlled scenarios — that’s why we try to avoid uncertainty at any cost. However, vulnerability, uncertainty, and unpredictability are here to stay. We cannot continue using a binary approach — reality is too complex to see through a right or wrong, black or white, success or failure approach. To thrive in this transition era, we need to embrace ambiguity. Our ability to understand and adapt to an ongoing transition is critical to succeed in the 21st Century. 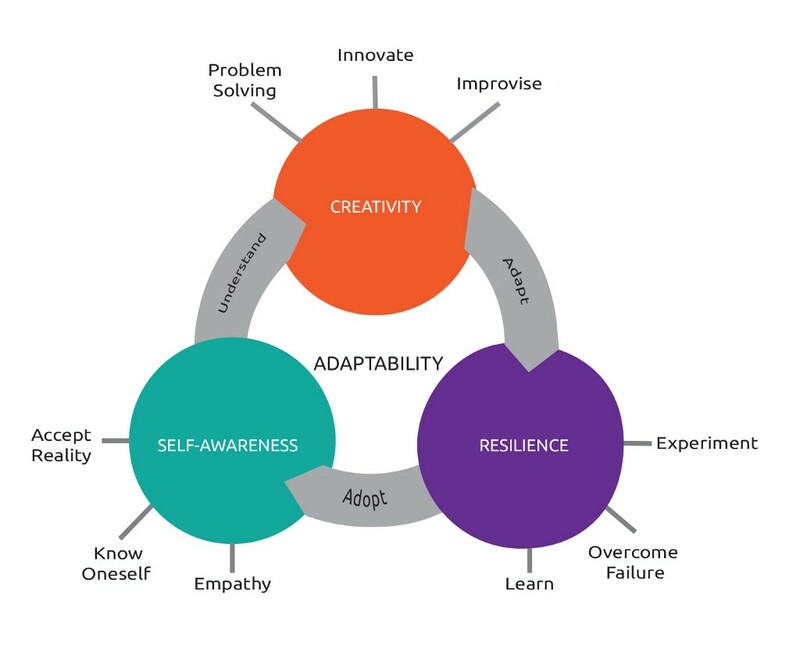 Adaptability is a competitive advantage — it increases your chances to thrive in change. Research shows that Adaptive Teams procrastinate less, are more productive, creative, and faster. Self-awareness is much more than simply know oneself; it’s crucial to understand reality and others. Creativity is not just about developing new ideas — the changing reality requires us to improvise and solve complex problems. Resilience is critical to face adversity and recover from failure — discovering new solutions requires experimenting and failing more often than not. Self-awareness is having an accurate view of one’s skills, abilities, and shortcomings. Self-awareness has a more positive impact on leadership than an MBA. Studies show that self-awareness encourages us to lead ourselves with authenticity and integrity — and in turn, better lead others. Teams with high self-awareness make better decisions, interact better with each other, and manage tensions and conflicts more effectively. The problem is that self-awareness is a scarce meta-skill. According to self-awareness expert Dr. Tasha Eurich, 90% of people believe they are self-aware but only 15% of them actually are — this gap creates lots of problems in the workplace. Know oneself: Self-awareness is not just seeing ourselves clearly, but also how others see us. Knowing oneself is critical to accept every part of who we are and become more vulnerable — Self-awareness turns our blindspots into bright spots. Self-acceptance drives self-esteem, thus alleviating conflicts with others. Accepting reality: Most people are at war with reality — rather than accept what’s going on, they act on denial. We cannot change what’s happening in the world, but we can change how we react. Accepting reality is focusing our attention on what happened rather than we wish should have occurred. When we resist, we get stuck. When we accept reality, we can act. Be more empathetic: Organizations are suffering from an empathy deficit. This is affecting collaboration and teamwork. Being unable to step out of what’s happening to oneself, diminishes our ability to listen and understand other’s point of views. Empathy is vital to embrace diversity of thinking and thrive in change. Creativity is more than developing original ideas; it’s about exploring new ways of solving problems. As I mentioned earlier, we need to let go of the binary thinking. Creativity is about integrating opposite forces through a ‘yes, and’ approach, as I wrote here. Similarly to self-awareness, our education system doesn’t encourage (or train) creativity. Improvisation: The international space station noticed a drop in pressure. The immediate reaction from one of the astronauts was to plug the gap with his finger to prevent more air leaking into space. That saved some extra air before the crew fixed the hole with the proper sealant. This example shows the importance to adapt to the unexpected — improvisation is finding a solution to a problem we never faced before. Problem-solving: The complexity of today’s problems requires expanding your thinking. Most executives are ‘level 1 thinkers;’ they refuse to consider other viewpoints, thought processes, or arguments. Complex issues need what Nobel Laureate Daniel Kahneman calls Deep-Thinking — a slow, deliberate, focused and reflective approach to solving complex problems. Innovation: Many organizations approach innovation with a certainty mentality — they believe the right process can uncover the right solution. However, innovation requires a new mindset — to embrace experimentation over perfection, empathy over egos, and doing over planning. Most corporate innovation initiatives fail because they focus on the process, but fail to adapt their culture first. Some people say Edison was too stubborn; others that he had an extraordinary grit. However, resilience is a meta-skill that can be developed. Experiment: It took Thomas Edison hundreds of ‘mistakes’ before we created a practical light bulb. Experimentation requires to be okay with living in constant uncertainty. Our brains are wired for certainty — when we don’t know an answer, we use speculation to fill the gap. Learning to embrace uncertainty requires rewiring your team’s brain. Overcome Failure: Resiliency as the capacity to rise above adversity. When something goes wrong, you must manage to stay in control rather than let the situation take over. Our thoughts, not grit, shape our perceptions and behavior. Support and coaching are critical to developing resilience — reverse mentoring can help your team a lot. Learn: Making mistakes is a means to an end — organizations must celebrate the lessons, not the mistakes. When I ask clients what’s their mistakes policy, most don’t know what to answer. How can your team learn from mistakes if companies don’t have a clear approach? Our conflictive relationship with errors is embedded in our culture since we were kids. Wrongologist Kathryn Schulz coined the term “Error Blind” to explain how (most people) don’t have a clue to know they are wrong about something until it’s too late. The above meta-kills are not meant to be perfect. I use them frequently to help upgrade team’s ability to overcome resistance to change by building a more adaptive mindset. This approach provides a structure for navigating this transition — people can focus on what they can control rather than worrying about what it’s yet to come. The key is to reconnect with our — intrinsically human — ability to adapt. And to take ownership of change rather than resist what we don’t know or can’t control. The Metaskills You need to Thrive in the 21st Century was originally published in Stretch for Change on Medium, where people are continuing the conversation by highlighting and responding to this story.